"This is a family favorite for home movie night; it's quick and easy and kids like the 'finger food' style." Preheat oven on broiler setting. With a sharp knife, remove tails from prawns, and butterfly them from the underside. Arrange prawns on broiler pan. In a small saucepan, melt butter with garlic and lemon juice. Pour 1/4 cup butter mixture in a small bowl, and brush onto prawns. Sprinkle Parmesan cheese over shrimp. Place broiler pan on top rack, and broil prawns for 4 to 5 minutes, or until done. Serve with remaining butter mixture for dipping. This delicious dish is ready in less than 30 minutes. These were absolutely fantastic! I made them as a side dish using large prawns - which cut the broiling time to 1-1/2 minutes. They turned out great! A definite keeper! 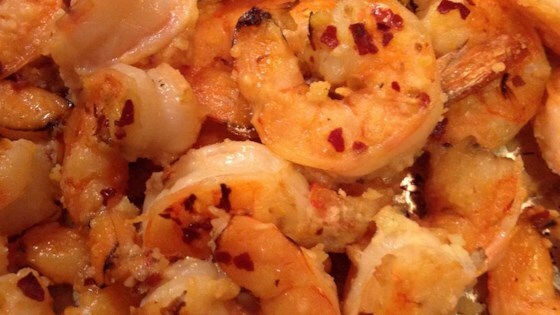 We LOVED this recipe for prawns! It was quick to prepare and simply vanished! Loved by kids and adults!